Today Volcom introduces the evolution of Volcom Brand Jeans with the launch of ‘Real Life Happening’, a campaign that questions modern technology’s interference with living an adventurous life. 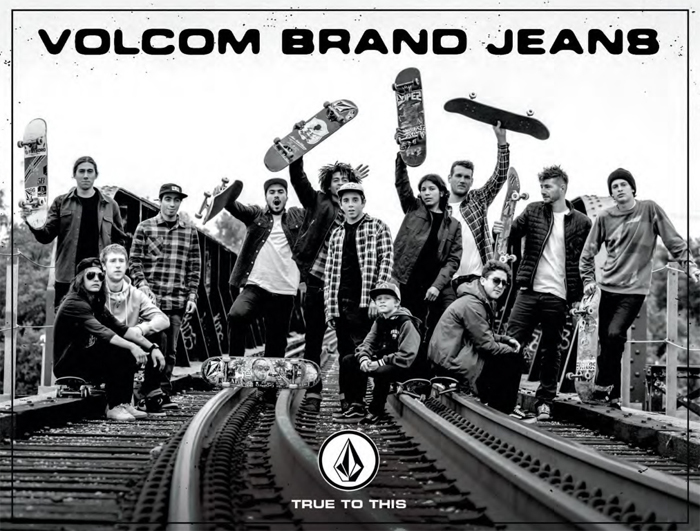 The inspiration for the campaign was inspired by Volcom’s newly redesigned denim collection, which embodies the ‘True To This’ movement. With a cleaner approach to timeless style, Volcom Brand Jeans are made for the pursuit of a Real Life Happening, featuring streamlined utility, high quality materials and several new functional characteristics inspired by two decades of life on the road. In celebration of the ‘Real Life Happening’ campaign Volcom produced a video that was shot throughout the United States over the course of 8 months, featuring indie-legends Run The Jewels and Kurt Vile alongside Volcom’s world renowned skate team as they ‘climb through the windows of their consciousness’. Through this video, Volcom presents a clear vision of ‘Real Life Happening’ and it’s effort to remind people to get off their phones and do something. Volcom continues to expand its legacy with the introduction of a new signature style denim, the Form Fit, inspired by the natural fit of well-worn jeans and the manner in which their shape conforms to your body. The naturally contoured shape in pattern was created to emulate functional form and enhance overall performance. The Form Fit is available in both the Vorta and Solver styles. Volcom Brand Jeans have also elevated their performance features adding durability and hold through a dual finish metal buckle button secured by a bar tacked piece of denim fabric, snag-free movement from embroidered rivets, and a clean finished interior providing less chafing and added comfort. Enhanced moisture wicking properties of the performance denims also provide a faster dry time allowing your body to stay cool. The new Volcom Brand Jeans are now available online at http://volcom.com/rlh and at select retailers worldwide.